A working parent can’t have too many quick and easy dinner recipes in their repertoire. The same applies to snacks. Something that can be easily made, served warm, are filling and delicious. 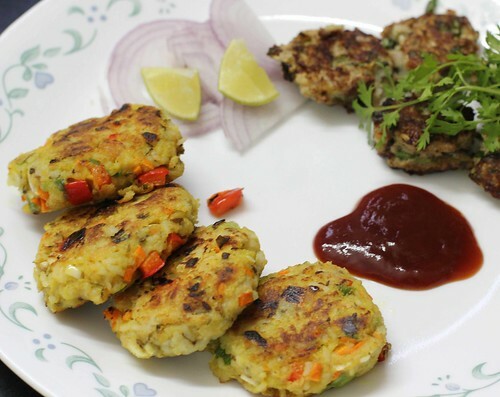 Savory rice cakes made with left over rice, fresh or frozen vegetables come to the rescue when you have made too much rice and the family will not have any more. Add dices vegetables of choice for color (bell peppers, kale, golden beets, red kidney beans),crunch ( celery, broccoli) and protein (shelled edmame beans, drained canned chickpeas ). Technically beans are not veggies but they add protein to the cakes and make them filling. And as they are staple of vegetarian diet, they fall under vegetable category for me. The possibilities to customize these savory cakes are endless based on what you have on hand and what flavors you crave. Italian seasonings, mexican spices and even Chinese spices can totally render this into a completely different snack. Rice being a binder, you don’t need anything else to hold them together. Add spices, mix and mash. Shape and either bake in oven or pan fry with a little oil. With a side of salad this can even be a filling meal. Colorful, flavorful and crunchy to boot. Not to mention the protein and the fibre. Make some extra rice ( or moong dal khichadi or risotto) just so that you can make these the following evening. Am sure this will soon be a staple in your house just like it is in ours! 1. Take rice in a large mixing bowl and break into smaller lumps with a spoon. 2. Add all the ingredients. Mix well. Taste and adjust seasonings. Shape the mixture into patties or cakes and set aside. 3. Heat oil in a non stick skillet. Fry them till golden brown and crispy on each side ( about 3- 4 minutes per side). Alternatively you can bake them at 325 F for 12 – 15 minutes till cooked through. Serve warm with ketchup or mint chutney and onions and extra lemon. Enjoy!